New Delhi is also considering the sale of BrahMos missiles to the Southeast Asian country, although no deal is imminent. India and Vietnam are likely to sign a defence agreement, under which Vietnamese pilots will be trained to operate Russian-built Sukhoi fighters, sources in the Indian Defence Ministry told RIR. The agreement is likely to be signed when Indian President Pranab Mukherjee visits the Southeast Asian country in September. The details are being finalised during the on-going visit of Indian External Affairs Minister Sushma Swaraj to Vietnam, the sources said. Vietnam had earlier asked India to train its defence personnel in using Russia-built Kilo class submarines along with the Su-30 fighters that the country uses. By 2015, Vietnam will have a fleet of 36 Russian-manufactured Su-30MK2 fighter jets. 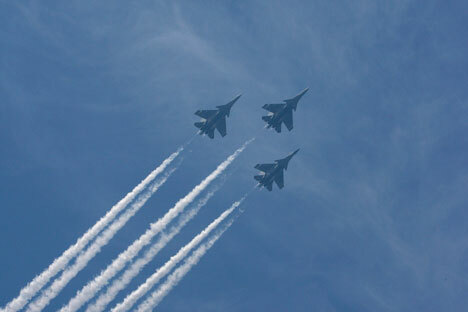 The Indian Air Force (IAF) operates a fleet of Su-30MKIs, air superiority fighters jointly developed by Sukhoi and Hindustan Aeronautics Limited. Malaysian pilots have also been trained by the IAF. Last year, India agreed to train 500 Vietnamese submariners to operate Kilo submarines that Vietnam will receive in 2016 from Russia. India will also consider the sale of the Indo-Russian BrahMos missiles to Vietnam, although a deal is not imminent, the sources added. They said Vietnam is keen to procure these missiles to combat a potential military threat from China. Relations between Hanoi and Beijing have cooled during the last few years because of disputed islands on the South China Sea, which are believed be rich in energy deposits. China claims territorial ownership of the entire sea and its islets and has similar disputes with many of its neighbours. Indian Defence Ministry sources added that while Vietnam is viewed as one of India’s strongest allies in Southeast Asia, the China factor would be a key in deciding whether to sell BrahMos missiles. “We understand their concerns, but then China is not ready to appreciate our concerns about the threat from Pakistan,” a Defence Ministry official told RIR on the condition of anonymity since he was not authorised to talk to the media. The official denied that Vietnam would be used as a bargaining chip with China, while adding that a few South American countries also approached India for the possible sale of BrahMos missiles.